Natural Shell Fashion 10 Pcs. 35mm Round Blacklip Shells & 1pc. 50mm Round Blacklip Shell Center Accent In Satin Double Cord / 40 In. 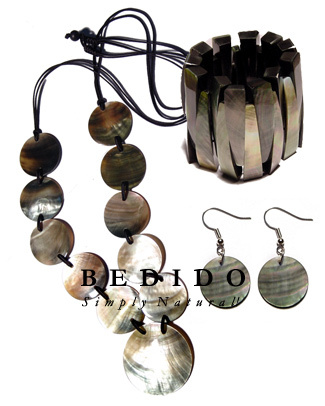 W/ Set Earrings And Elastic Bangle Set Jewelry - Widest collection of handmade body jewelry we also have unique decorative shell, wood and coconut handicrafts.